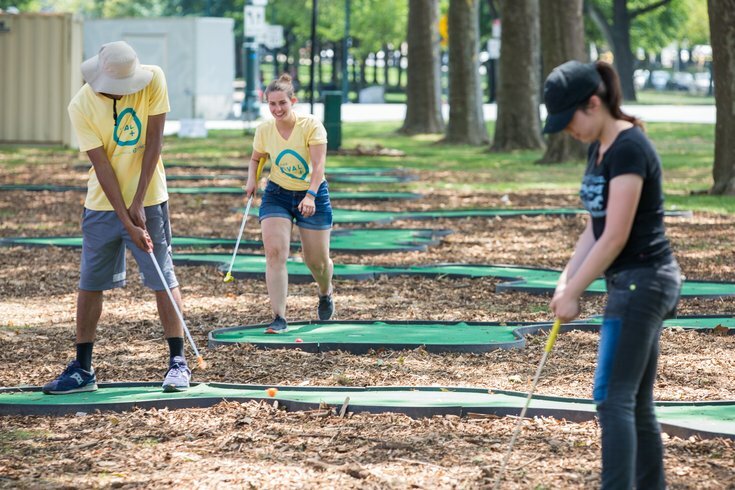 In addition to the beer garden, there are games, a giant sandbox, a maze, and also free miniature golf available at The Oval+. Eakins Oval and and surrounding lawns at 24th Street and the Benjamin Franklin Parkway will once again become The Oval+ this summer, from Friday, July 20, through Sunday, Aug. 19. All ages are invited to enjoy the space, where there will be games, food and drink, free events and an art installation. This year, there will be large-scale mural installations by Mural Arts Philadelphia at each closed intersection. "From kayaks on the Schuylkill to the soaring arches within the Wissahickon to the growing towers of Center City, each crosswalk illustrates the transition from park to city and back again," according to a press release from Fairmount Park Conservancy and Philadelphia Parks & Recreation. A water misting station and a giant, 800-square-foot sandbox will be new for 2018, too. Returning will be mini-golf, a pop-up beer garden (this time with Meltkraft sandwiches), rotating food trucks and free, themed programming. Make sure to check out "Wellness Wednesdays," "Arts & Culture Thursdays," "Food & Flicks Fridays," "Game Day Saturdays" and "Family Fun Sundays" this summer. Check back for more details on The Oval+ as they are announced.